The title sounds like the success story of the American dream. Thanks to American economic freedom, immigration, savings and investments, the importance of the dollar in the 19th century and the first half of the 20th century was continuously rising. 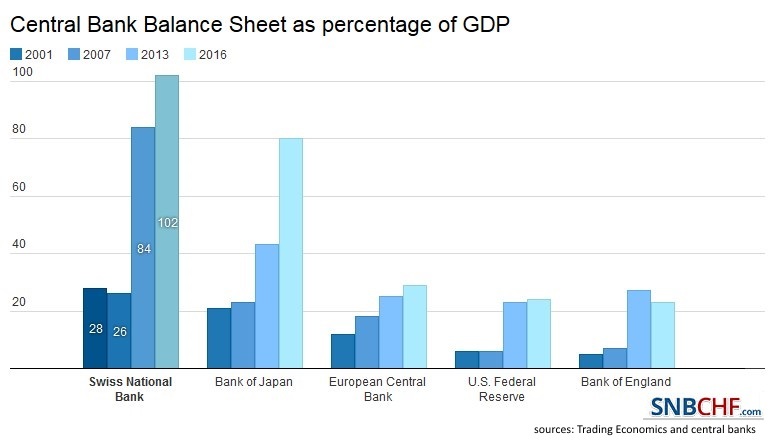 Still, due to the gold standard, the success of the US economy and its currency could not be measured in US dollar appreciation, but in terms of gold owned by the central bank. 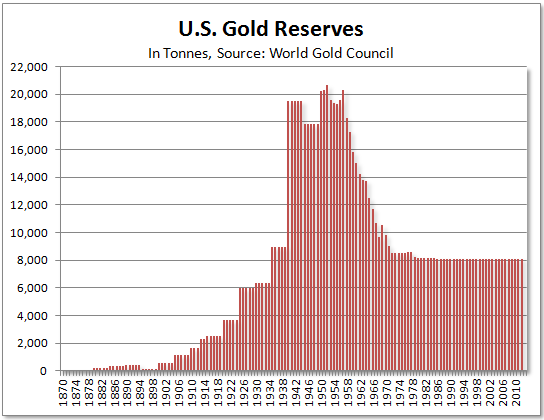 U.S. current account surpluses, and consequently U.S. gold reserves, were rising until WWII, while Germany ran huge deficits and went bankrupt in 1923. Since WWII, US savings rates and investments have been weak, in comparison to other countries. Welfare costs and state interventions have increased, and immigration to the US has significantly weakened, especially since the year 2000. As for first education, U.S. education has become weaker than in many other economies. The new success story of economic freedom, immigration and savings are countries like Switzerland, Singapore, Norway, Sweden and in the future, possibly even Germany. Two of them, Switzerland and Singapore additionally offer low tax-regime. Especially wealthy “tax-evaders” and highly-skilled immigrants go to these countries in order to avoid high taxation. The UK is a similar immigration country but it has it problems with savings that are often low. 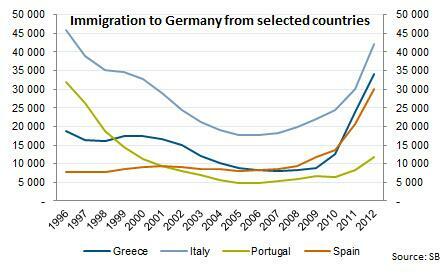 1) Immigration helps to increase credit growth and real estate prices. Via monetarist theories, this helps to increase inflation, but also interest rates and demand for the currency. 3) Thanks to these surpluses the financial position is strengthened. With immigration local investors tend to buy far more local assets than e.g. Americans. 5) The perpetual alignment between rich and poor nations can be countered with immigration of highly qualified personnel into these richer countries. In the following we provide evidence for our thesis citing recent research by Swiss and OECD economists. Christoph Carl Basten and Michael Siegenthaler of the Zurich KOF economic research institute find out that the unemployment level of non-immigrants has been reduced as a result of the immigration of foreign employees. From 2002 to 2011, the foreign labor force grew by 351,737 persons (+32.8%) in Switzerland, which is a substantial influx in relation to the total of 4.27 million employees as of January 2002. The “new immigration wave” to Switzerland is linked to the enactment of a Free Movement of Persons Treaty (FMP) with the EU/EFTA states in June 2002 that gradually led to a full liberation of immigration from these countries. Apart from increasing the number of immigrants to Switzerland, the FMP is also likely to have had two qualitative effects on immigration. On the one hand, the FMP shifted the region of origin of immigration: while most net migration to Switzerland in the 1990s could be attributed to non-EU European, especially ex Yugoslavian countries, 75% of the net increase in the foreign resident population between 2000 and 2010 is due to immigration from EU member countries. 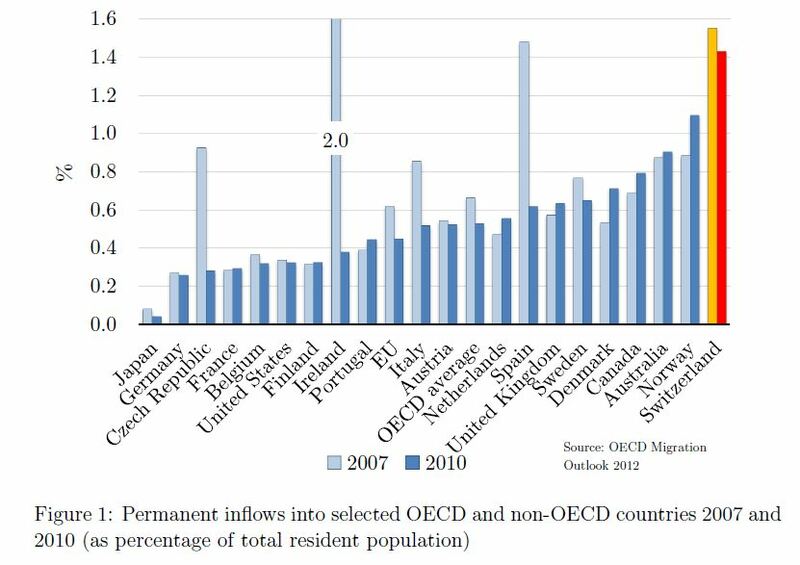 On the other hand, the FMP is also likely to have contributed to the marked increase in importance of high-skilled immigration to Switzerland [SECO et al., 2012]. while only 20% of the permanent immigrants to Switzerland from 1986 to 1995 had a tertiary education, this share was 51% [SECO et al., 2012] from 2002 to 2011. In 2010, 52% of all German citizens between 25 and 64 years living in Switzerland had a tertiary education compared to 29.6% within Switzerland’s population of this age according to the Swiss Labor Force Survey. Read the research by the University of Indiana to understand the economic details why immigration might be hurting the US economy now. It is by no means clear that immigration helps a country’s citizens, even apart from issues of crime and use of public benefits. It is crucial to determine whether immigration puts so much pressure on xed inputs to production that the extra domestic product fails to reward domestic owners of labor complements (e.g., capital) more than it hurts domestic owners of labor substitutes (e.g., labor itself). 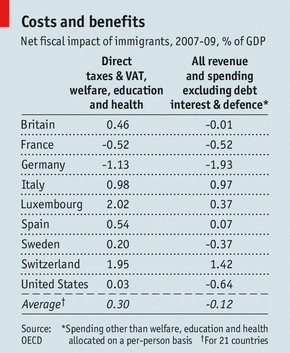 The Economist cites an OECD study that found that “immigration has a favourable impact on national budgets”. Interestingly it shows that Germany saw a negative immigration effect: highly qualified German personnel moved to Luxembourg and Switzerland, while Germans had to accept less-qualified immigrants that weighed on the budget. Well-qualified immigrants (e.g. Germans) that went to Switzerland, however, helped to push up revenues and spending excl. welfare, education and health by 1.42%, while Germany lost 1.93%. Sweden does not have such harsh (implicit) qualification criteria for immigrants as the Swiss, but they are more open to asylum seekers. Consequently the immigration balance is negative for the Scandinavians. 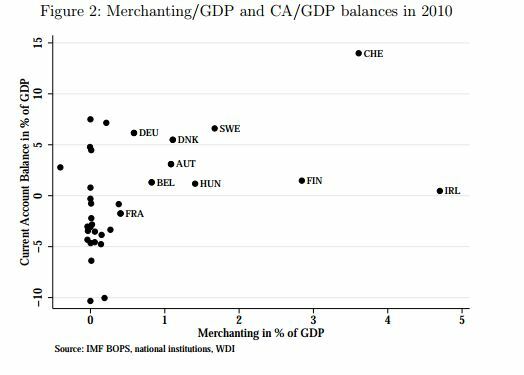 The SNB working paper by E. Beusch, B. Döbeli, A. Fischer and P. Yesin showed that merchanting, i.e. 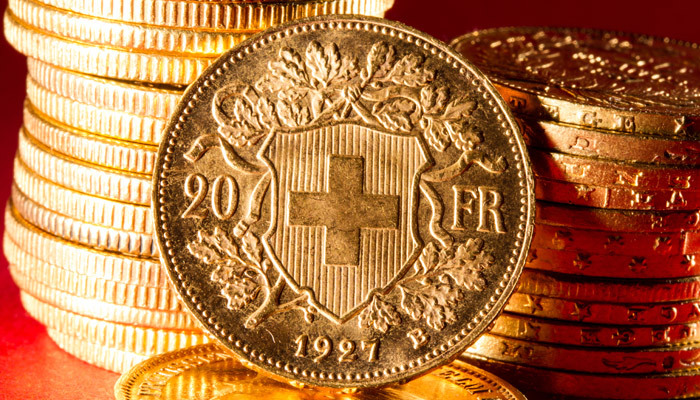 purchases and sales of commodities, contributed an additional 3% surplus to the Swiss current account. Other countries like Finland and Ireland profit from merchanting, especially the Irish current account is highly dependent on this trade. In our post on the secrets of the Swiss trade surplus we also presented the huge merchanting surplus. Technically, the Swiss form of merchanting is a service, because the goods generally do not touch Swiss soil. The decision of Glencore and others to relocate these services to Switzerland were mostly tax reasons – similarly to Ireland . The highly-paid employees, possibly many foreigners, certainly increased the welfare and tax basis in Switzerland. The 10:1 referendum initiative, namely that a CEO can earn 10 times more than the lowest paid employees, could put Glencore’s commitment to Switzerland in danger. Merchanting is only one example that shows that economic freedom and low taxes help to attract immigrants and boost fiscal revenues. 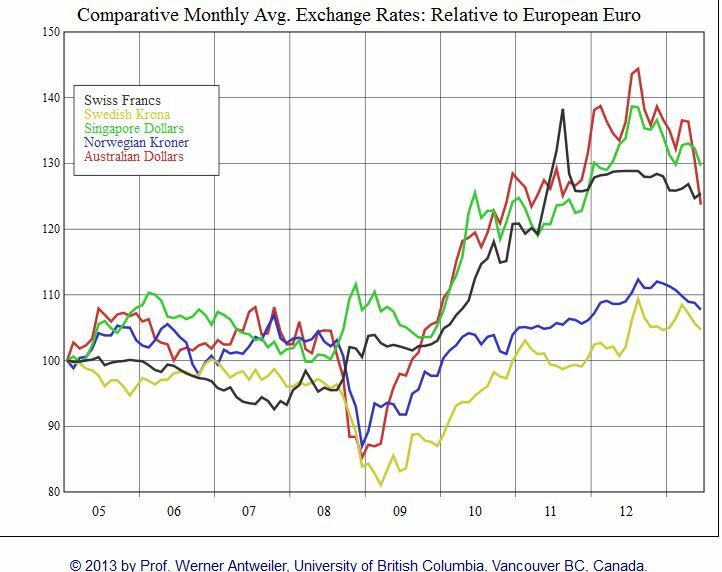 The following graph shows the performance of these immigration currencies against the euro since 2005. 1) Australia is already after the immigration-caused “hype”. Australia does not produce current account surpluses to counter this movement, but profited on the China boom. The RBA has successfully fought inflation and rising salaries with higher interest rates. Inflation rates are already falling and this seems to be sustainable. But house prices are falling from highly overvalued levels (140% of income). With foreign capital getting withdrawn, the Aussie has collapsed recently. 2) The SGD, SEK and NOK are still “on the top of the hype”. They have strong immigration, current account surpluses and rising salaries. 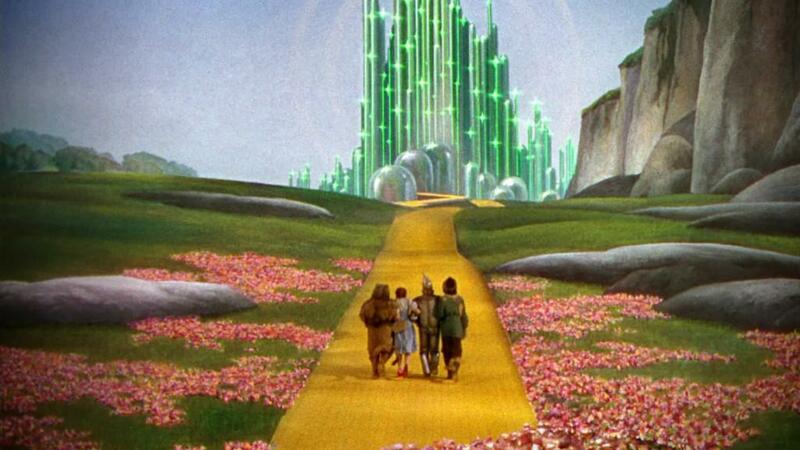 They were facing inflationary pressure and have a housing bubble. They have explicitly used the currency to fight against these pressures. 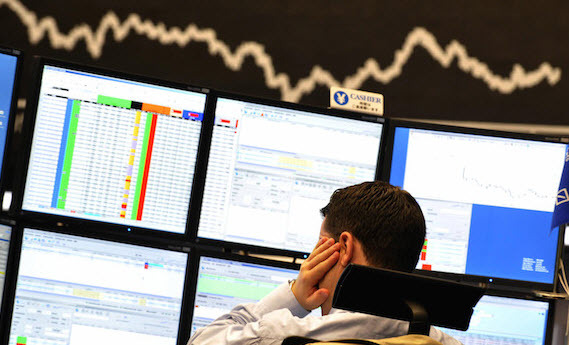 Most recently inflationary pressure has eased, what gives room to some currency depreciation. 3) The Swiss and Germans are still “before the hype”. Both have huge current account surpluses and high immigration. 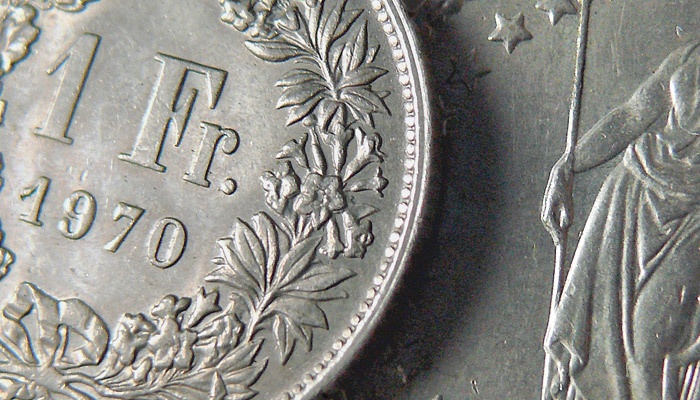 SNB has successfully combated a too rapid franc appreciation. Currently Swiss companies are still taking profit on an initial “wage dumping” for immigrants. Labour costs and wages in Germany, however, are rising by 3-4% per year, the Swiss ones still only by 1%. 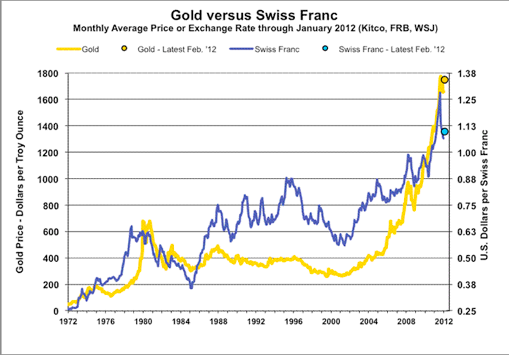 Both German and Swiss home prices are undervalued. 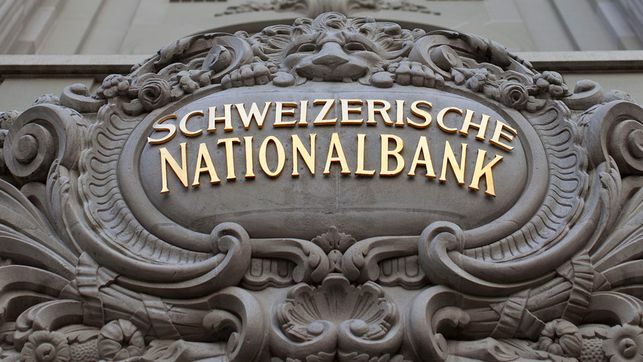 The SNB might lose the battle against markets once the Swiss labor market gains more dynamics and the well-qualified immigrants change their wage expectations upwards . 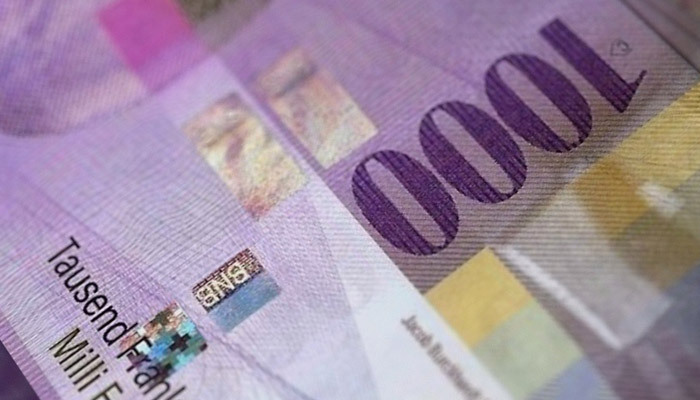 Switzerland will potentially follow some of the salary rises of the “big brother” Germany.